C39Tools barcode software is the fastest, simplest way to make Code 39 barcodes. Make Code 39 and Code 39 full ASCII barcodes in Excel spreadsheets, SAP Crystal Reports and more. 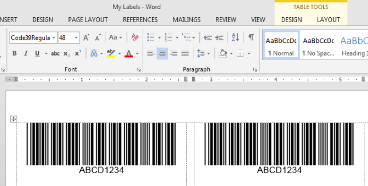 C39Tools comes with twenty-seven different Code 39 barcode fonts in TrueType and other formats, a barcode wizard to create barcodes one at a time, and add-ins to make and print barcodes in your favorite database, document, label or design application.